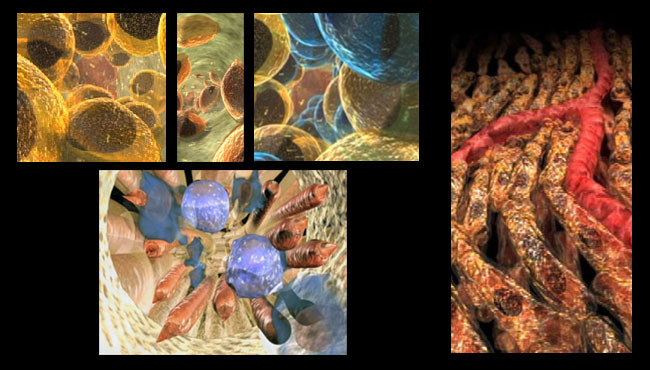 Tissue Engineering for Life, Directed by John Pollock, is a planetarium show focusing on tissue engineering and its applications with the goal of delivering the scientific content through an interactive, multimedia planetarium presentation that brings together technology and the arts. In addition to the planetarium show, which debuted in Pittsburgh in 2002 before traveling to other planetariums worldwide, the project’s goals included development of curriculum materials for use in classrooms, and an outreach program that targets K-12 youth in under-represented and under-served rural and inner city communities. A Science Education Partnership Award from the National Institutes of Health’s National Center for Research Resources has allowed the Pittsburgh Tissue Engineering Initiative to partner with the Carnegie Science Center, Carnegie Mellon University, University of Pittsburgh, Pittsburgh Supercomputing Center and the University of Pittsburgh Medical System.